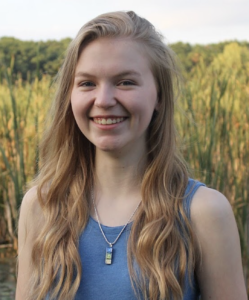 Meet Zoe Berg, an aspiring mechanical engineer, Lakeville South High School senior and rockstar member of the Aspirations in Computing community with four awards to her name – 2018 National Honorable Mention, 2018 State Winner, 2017 State Honorable Mention, and 2016 Certificate of Distinction honoree. She first applied for the Minnesota Aspirations in Computing (MNAiC) award in ninth grade due to the encouragement and support from her mom. Good thing she applied, because she has not only gained state and national recognition, she also benefited from a diverse network of individuals, businesses and organizations intent upon guiding and supporting her STEM learning interests. 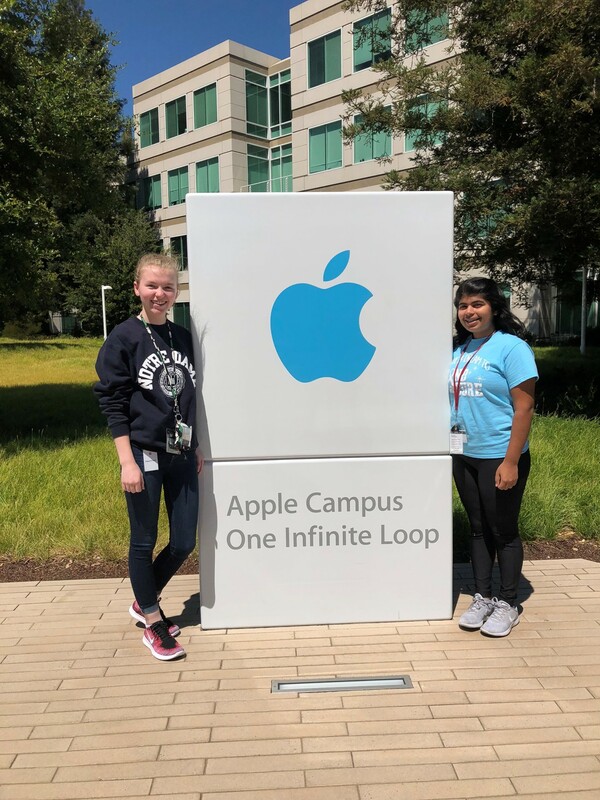 This summer, MNAiC connected Zoe with the opportunity to participate in the Apple Engineering Technology Camp through the National Center for Women and Information Technology (NCWIT). 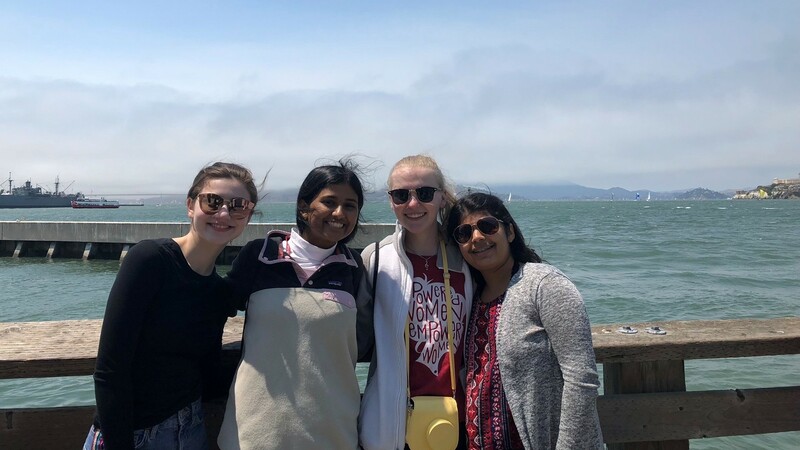 It was a highly selective four-week camp at Apple headquarters in California, and Zoe was one of 25 eleventh and twelfth grade high school students to attend. She worked on a team mentored by Apple employees to create a solution to an engineering problem which they presented to Apple leadership at the end of the program. In Minnesota, Zoe also attended a résumé and interview workshop offered at Veritas Technologies in Roseville, another opportunity resulting from her MNAiC connections and one she would recommend. In the future, Zoe plans to major in mechanical engineering and aspires to be an Apple intern and Disney Imagineer. Her passion for mechanical engineering stems from her introduction to robotics in the fourth grade. She is a founding member of The Green Girls robotics team and has participated for nine years. Zoe is the lead CAD designer who designs the robot using Creo software, executes virtual testing and creates custom parts. Along with her team, she teaches biweekly STEM classes at the PACER Center and for Dakota County foster children, and she led a robotics class for a day at a camp program. If you think Zoe’s computing experiences stop there, we’ve got news for you! She was also an intern at Stellar Hearth, where she designed custom fireplaces, and at EAC Product Development Solutions, where she used Python and Raspberry Pi to program LEDs. In 2017, she met with the United Nations Educational, Scientific and Cultural Organization (UNESCO) to expand the Robots Without Borders program. In January, she participated in the United Nations (UN) Youth Forum in New York, sharing her STEM experiences with world leaders in sessions and streaming live on UN social media platforms. Zoe highly recommends that young women in Minnesota high schools apply for the Aspirations in Computing Awards program. She plans to reapply to seek the highest honor of national award winner. There are many levels of recognition. Selected or not, applicants are all winners, as they are routinely provided exclusive announcements about FREE and low cost technology learning opportunities. The award application submission deadline is November 5, 2018. Don’t delay, start your application now — apply here. The Minnesota Aspirations in Computing (MNAiC) Award Program partners with the National Center for Women and Information Technology (NCWIT) to honor young high school women for their computing-related achievements and interests. The powerful story of their accomplishments does not end at a recognition ceremony in the spring of each year, it’s just beginning! Nearly 200 young women who have been honored since the Minnesota Aspirations in Computing Program inception in 2012-2013 continue to pursue life-changing education and career opportunities and accomplish AMAZING things. The ‘Where are they Now’ series provides wonderful illustrations of Aspirations in Action. Congratulations, Zoe Berg!